DeMar DeRozan and the Raptors look to wear down LeBron James in their latest playoff matchup. Maybe the Toronto Raptors would have preferred to avoid the Cleveland Cavaliers, either by having the Cavs on the other side the bracket or by having them eliminated by the Indiana Pacers in the first round. But their conference semifinals series against the Cavs is not only an opportunity for the Raptors to exorcise some demons, but also an opportunity to be the first Eastern Conference team in eight years to eliminate LeBron James from the postseason. The Raptors have been the better team all season. But James can be the ultimate difference maker in any series he plays and a series against the Cavs is the ultimate test of the changes that Toronto has undergone this season. Having a more modern offence, a stronger defence, and the best bench in the league won't mean much if the Raptors' season ends in the same round and against the same opponent as it did last year. 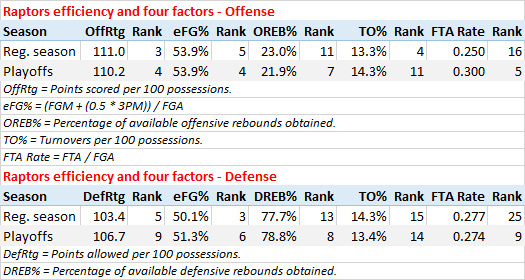 Here are some statistical notes to get you ready for the Eastern Conference semis, with links to let you dive in and explore more. Game 1 is Tuesday at 8 p.m. ET on TSN Network. First round: Beat Washington in 6 games. Allowed the Wizards to attempt only 26 percent of their shots from 3-point range, the lowest rate in the first round and down from 31 percent in the regular season. Had the best fourth quarter defence in the first round, allowing just 90.5 points per 100 possessions in the final 12 minutes of regulation. Were a plus-44 in the first and fourth quarters and a minus-30 in the second and third. Starting lineup had an effective field goal percentage of 61 percent, the second best mark among 10 lineups that played at least 50 minutes in the first round. 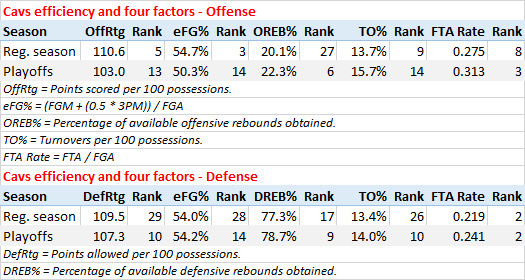 It averaged 103 possessions per 48 minutes, the most among those same 10 lineups. Led the league in aggregate bench NetRtg (plus-8.3) in the regular season, but ranked last in the first round (minus-15.0) through Game 4. In Games 5 and 6, that mark was plus-23.6. Rank third in player movement (10.8 miles travelled per 24 minutes of possession) and eighth in ball movement (317 passes per 24 minutes of possession) in the playoffs. OG Anunoby took 26 of his 27 shots from the restricted area (11) or 3-point range (15). That (96 percent) is the second highest rate among 112 players with at least 25 field goal attempts in the playoffs through Sunday. DeMar DeRozan ranked fifth in usage rate in the first round, using 33 percent of the Raptors' possessions while he was on the floor (up from 29 percent in the regular season). DeRozan ranks leads the postseason with 11.5 points per game scored as a pick-and-roll ball-handler. DeRozan shot just 14-for-43 (33 percent) from mid-range, the worst mark among 14 players with at least 25 mid-range attempts in the first round. Kyle Lowry had an effective field goal percentage of 56.7 percent on pull-up jumpers, the second best mark among 35 players who attempted at least 20 in the first round. Lowry averaged 33 assists per 100 possessions used, the fourth highest rate among 100 players who averaged at least 20 minutes per game in the first round. C.J. Miles took 78 percent of his shots from 3-point range, the fourth highest rate among 112 players with at least 25 field goal attempts in the playoffs through Sunday. Jonas Valanciunas ranked fifth in offensive rebounding percentage, third in defensive rebounding percentage, and third in total rebounding percentage among 100 players who averaged at least 20 minutes per game in the first round. Delon Wright had 14 steals, six blocks, and just seven personal fouls in the first round. That (2.9) is the best ratio, by a wide margin, of [(steals + blocks) / fouls] among players that have played at least 100 minutes in the playoffs. Only team that advanced to the conference finals having been outscored in the first round. Won four games by total of 14 points and lost three games by a total of 54. Averaged 7.1 fewer possessions per 48 minutes than they did in the regular season. That was the biggest drop in pace from the regular season to the first round. Scored 7.5 fewer points per 100 possessions than they did in the regular season. That was the biggest drop in offensive efficiency from the regular season to the first round. Had the first round's second best first-half offence (111 points scored per 100 possessions) and its worst second-half offence (95 per 100). Took only 38 percent of their shots in the paint, the lowest rate in the playoffs. Though they played seven games, they didn't have a lineup that played more than 44 minutes together. Rank 15th in both in player movement (9.5 miles travelled per 24 minutes of possession) and ball movement (274 passes per 24 minutes of possession) in the playoffs. Allowed the Pacers to take 34 percent of their shots from 3-point range, up from 28 percent (the league's fifth lowest rate) in the regular season. That was the biggest jump from the regular season to the first round. LeBron James led the first round in points per game (34.4) and was the only player with three games of 40 or more points in the first round. The Cavs were 4-0 when he scored 30 or more points and 0-3 when he didn't. James was one of four players with a first-round triple-double, registering 24 points, 10 rebounds and 12 assists in Game 1 vs. Indiana. He led the first round with 11.0 free throw attempts per game. He shot 82 percent from the line, up from 73 percent in the regular season. James' 10.3 isolation possessions per game rank second the postseason. His 1.01 points per possession on isolations rank eighth among 21 players who have averaged at least 3.0 isolation possessions per game in the playoffs. James assisted on only three corner 3-pointers in the first round after assisting on 1.6 per game in the regular season. Though they've played seven games, no Cavs ranked in the top 10 in corner threes in the first round. Kyle Korver took 89 percent of his shots from 3-point range, the highest rate among 112 players with at least 25 field goal attempts in the playoffs through Sunday. Korver has shot just 4-for-15 (27 percent) on corner threes, the worst mark among 14 players who have attempted at least 10. Kevin Love had an effective field goal percentage of just 42.0 percent, the fifth worst mark among 59 players who attempted at least 50 shots in the first round and down from 55 percent in the regular season. That's the second biggest drop among 62 players who attempted at least 300 shots in the regular season and have attempted at least 50 shots in the playoffs through Sunday. J.R. Smith averaged 3.84 miles per hour on offence, the slowest speed among players who averaged at least 20 minutes per game in the first round. James (3.91 miles per hour) and Jeff Green (3.92) averaged the third and fourth slowest speeds on offence, respectively. See Cavs-Pacers preview for regular season notes. Kyle Lowry and Serge Ibaka both missed the first meeting for Toronto. C.J. Miles missed the second meeting, which was the second game of a back-to-back for the Raptors. The Raptors' five-man bench unit - Fred VanVleet, Delon Wright, Miles, Pascal Siakam and Jakob Poeltl - played just 10 total minutes (in the April 3 game) against the Cavs this season. The last two meetings took place after the trade deadline, but Rodney Hood and Larry Nance Jr. both missed the March 21 game, and George Hill missed the April 3 game. Kyle Korver also missed the March 21 game and no Cavs lineup played in more than one game (or for more than 16 minutes) against the Raptors. The 118.9 combined points scored per 100 possessions were the most scored in a regular season series between two Eastern Conference playoff teams. The 15-for-24 that the Cavs shot in the March 21 game was the best they shot from 3-point range in any game and the best any team shot from 3-point range against the Raptors this season. But over the three games, the Cavs took less than 33 percent of their shots from 3-point range, their lowest rate against any Eastern Conference opponent. Eight Raptors averaged at least 11 points per game (in two games or more) against Cleveland, but none of the eight averaged more than DeMar DeRozan's 17.7. In each of the first two meetings, the Raptors won the second quarter by 19 points. Jose Calderon played in all three games, shot 7-for-9 from 3-point range, and was a plus-36 in his 60 minutes. The Cavs were outscored by 61 points in 84 minutes with him off the floor against Toronto. LeBron James' 17 assists in the March 21 game were the most any player had against the Raptors this season. OG Anunoby was the primary defender on James. James shot 13-for-21 (62 percent) on those possessions, though he didn't shoot as often as he did on average, and the Cavs scored less efficiently than did on average. The most common matchup on the other end of the floor was Kevin Love defending Jonas Valanciunas. The Cavs scored 129 points per 100 possessions and were a plus-11 in 57 minutes with James and Love on the floor without a center. In 20 minutes with James and Love on the floor with a center, they scored 117 points per 100 possessions and were a plus-0. J.R. Smith (72 possessions) and Jeff Green (60 possessions) were the most common defenders on DeRozan. Against almost every Cavs defender, DeRozan shot less than he does on average. The same goes for Lowry against his most common Cleveland defenders.